Almost every business communication runs on email today because 72% consumers prefer emails as a source of communication and 86% consumers enjoy receiving promotional emails monthly. Email is the first thing which comes to mind when looking for a direct way to connect and interact with your target audience. Emails are highly targeted. Gone are the days of placing an advertisement on television and promoting your business to everyone. Technology is becoming smarter so you should too. Advertise your business only to your target audience. 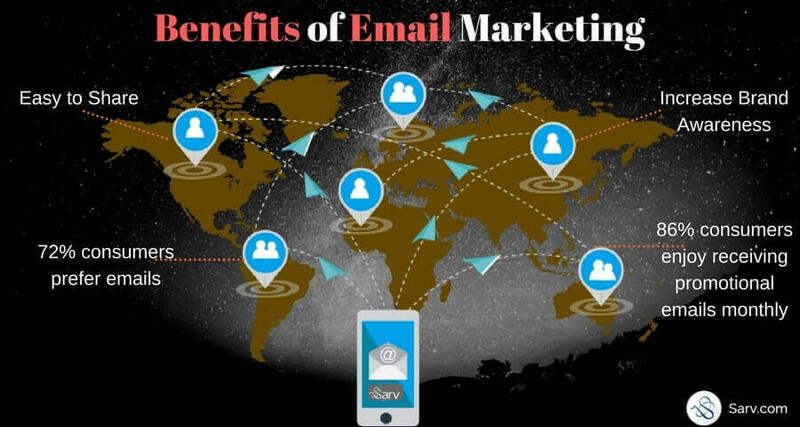 Email marketing gives you the ability to control exactly who sees an email by segmenting your contacts according to their previous behavior, lead status, demographics etc. Targeting emails ensure that your audience receives the mail according to their needs or requirements. This reduces the risk of email getting into the spam folder. One of the biggest advantages of email marketing is that it’s easily shareable. With a simple click, subscribers can share your email information, news and offers with their friends on social media. Believe it or not but even today every marketing strategies fail in front of word of mouth marketing. Your business gains credibility and more exposure when your subscribers share your information. The most appealing advantage of email marketing is high ROI. It’s an inexpensive way of marketing. No printing expense, no postage expense, and no advertising expense. Moreover, the recent study brings out the fact that email marketing brings $44 for every $1 spent. Analytics are crucial for getting the results and measuring the success of any campaign. Email marketing brings valuable and precise metrics which includes clicking to deliver rates, retention rates, delivery rates, open rates etc. These insights include the information about customer interests and behavior. Bulk email marketing service is one of the successful and affordable tactics for creating brand awareness and driving sales. Every email you send creates an opportunity for you to get exposed to your target audience. Your business will consistently build trust and gain value with strategic planning and targeted content. When you share the informational content with your audience, you stay top of the mind. So your business stands first when your audience needs that particular product or services. There’s lot to mention about email marketing. The more you dig, the more you’ll discover the incredible and proven benefits of email marketing. But the above mentioned are everlasting reasons you can consider for your business. Stay tuned for more insights on email marketing.